Training Days! Ella is Ready to Pop & Here’s the Opening Menu. Bagel or Begel, Mr. Schwartz? 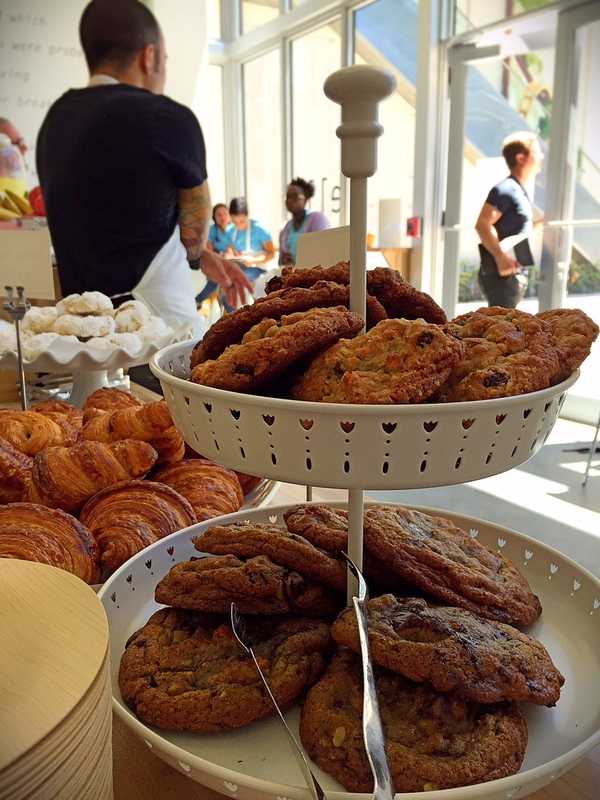 True Loaf pastries greet customers with layers of buttery smiles. Training is in full-force at our highly anticipated pop-up café, ella, opening in the Design District’s Palm Court hopefully by Thursday. Here’s a deeper look into the menu and its 3 sections: “until 11am”, “all day”, and “after 11am”. 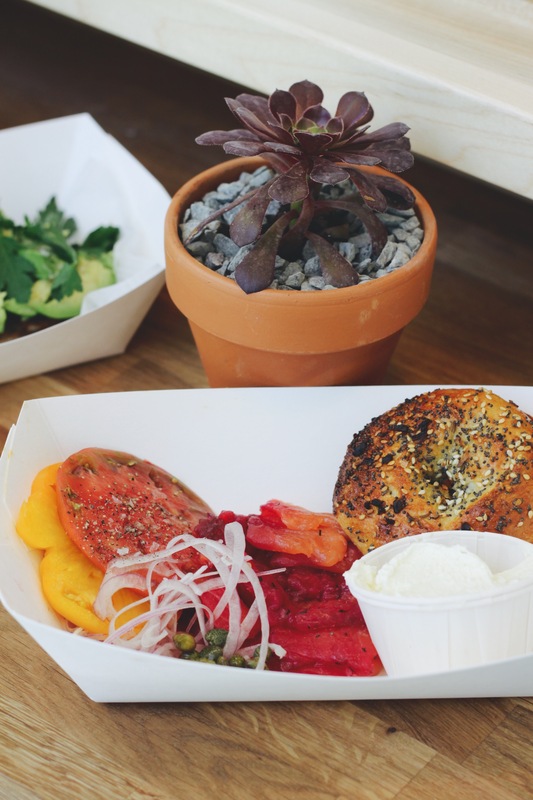 Opening in the morning, ella’s “until 11am” section will consist of more breakfast-ey items that are perfect for people who work in the area picking up a quick bite or hungry shoppers on the go. The 9-grain pancake, a dish originally on the Michael’s Genuine brunch menu, features 9-grains in the batter, adding heartiness to this supple pancake. The breakfast sandwich is a classic take with the simple bacon, egg, and cheese line up on a fluffy english muffin. Last is the power breakfast, and it is just that! This healthy “picker-upper” combines Greek yogurt with Michael’s balanced, delicious mix of chia jelly, banana, blueberries, granola, pumpkin seeds, hemp seeds, and dried mulberries. The everything bagel in all its glory… with everything. He starts with the usual suspects- yeast, flour, water, salt- and lets the mixture rise (about 20-30 minutes). 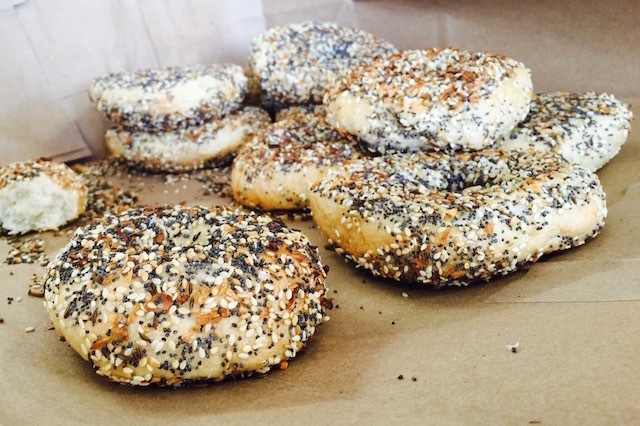 He then divides them into balls, flattens them, and cuts a hole in the middle, creating the classic bagel shape. After letting them rise again, they go into a boiling pot of water with barley syrup to add flavor and a crust on the outside of the bagel for one minute on each side. They are then given an egg wash, dipped into an everything topping, and baked in a 400 degree oven for 15 minutes. The end result is a perfectly chewy and light bagel. They are topped with a beautiful beet-cured salmon, which has a red color given by the beets. The salmon is cured overnight in a beet and gin purée, then rinsed and cured again in herbs. It adds a perfect saltiness to the bagel. The “after 11am” section features classic lunch items such as a daily soup, a grilled cheese with caramelized onions, and an heirloom tomato salad with feta and pickled onions. There are also a couple more unique items, such as the vegetable tacos that come decked out with black beans, avocado, pickled onion, cilantro, and cotija cheese, all on a tequila blue masa tortilla. Also the rock shrimp summer roll, which is a light and refreshing roll filled with fresh herbs and veggies to create the perfect bite for a hot summer day. ella is located in the interior west end of Palm Court at 140 NE 39th Street, unit 136 to be exact. In addition to street parking, the Design District offers valet from $5 located at the entrance to Palm Court on 39th Street in between NE 1st and NE 2nd Ave and the Palm Court Parking Garage is open from 9 am to 9pm Monday-Saturday and 11am – 7pm on Sunday, $3 for the first 4 hours, $6 for 4-6 hours, and $25 for 6+ hours, with the entrance located on NE 38th St. Ascend through the Dome and look for the umbrellas. The café will serve fresh-squeezed orange juice, Panther Coffee, Art of Tea, bottled cider and beer including Chef’s Michael’s Genuine® Home Brew, and a selection of wines by the glass and bottle including the house Lua Rossa blend. There is indoor counter seating for 8 and seating outdoors for up to 40 with umbrella-shaded tables and potted herbs and succulents. Take a seat and enjoy the day with whatever beverage suits your fancy, and choose from our daily charcuterie and cheese selection from the butcher’s board. Hours of operation will be Monday to Saturday from 9am – 7pm and Sunday from 12pm to 5pm. ella offers takeout and will accept all major credit cards. 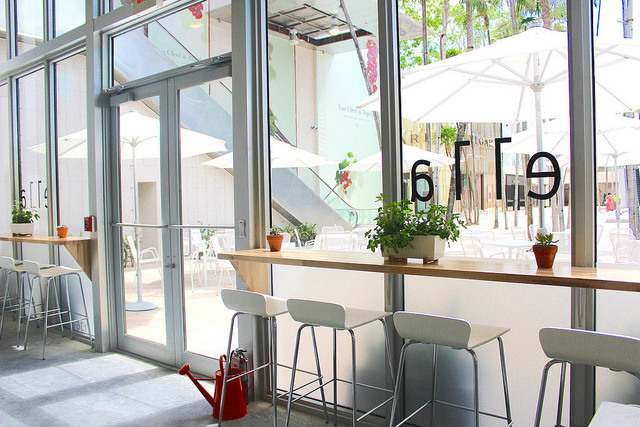 For more information, visit ellapop.me or follow the café on Instagram and Twitter @ellapopmiami. See you there soon! ← Who’s Your Daddy? Cayman’s Burger Beer Bash & Special for Father’s Day!